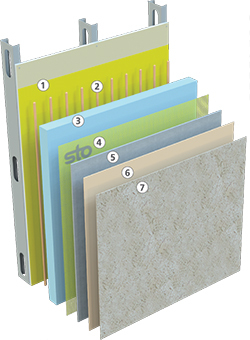 StoTherm ci XPS incorporates StoGuard liquid-applied air and moisture barrier and Dow STYROFOAM Panel Core 20 Insulation. It uses a polyurethane spray foam adhesive to attach the insulation board to prevent thermal bridging from mechanical fasteners. Provides an R-value of 5.0 per inch. Available in a wide range of decorative and protective finishes.